Dr. BBQ in Da Hood! In the 30 years I had visited Ocean Beach as a tourist before moving here almost 7 years ago, I was a fan of the BBQH. For at least the last 25 years, they have been serving their delicious Que for the beach community and their tourists in two different spots on Newport Avenue, the beach town’s main drag. They used to be up near the old Strand Movie Theater, now a souvenir shop called Wings. Many years ago they moved closer to the water in their current, but much updated spot. In between those two places, they were even in Mission Beach for awhile. So glad they came back to the OB hood! Over the last year, they did a major renovation and reinvented themselves as a much more upscale place than the joint that they were. This actually made me a bit nervous when I went to their soft opening back in July of 2015. I had heard they hired a chef. 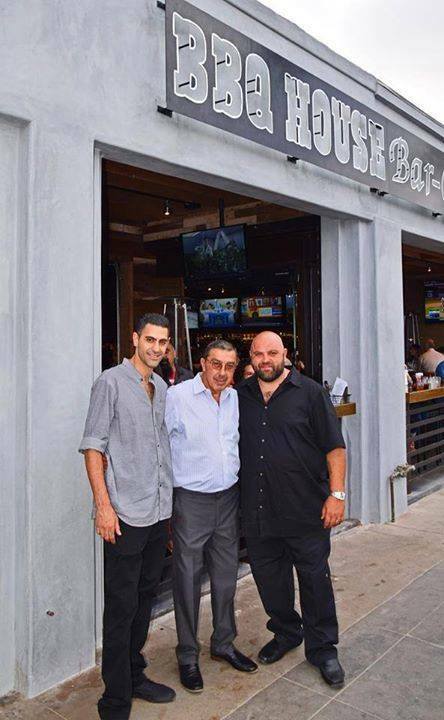 After years of the owner and his two sons doing all the cooking, they decided to make a change. I had teased the father, Abdul, asking if he would ever retire when I did a review of them for a local online web site back in 2012. He said never. But that looked like it was about to change. And change it did. There were hopes that the new chef would bring his dishes in along with their old standby BBQ. Turns out, he wasn’t a BBQ pitmaster and their Que seemed to suffer. After never having a bad meal there, I had a very overcooked platter of food that my boyfriend and I were quite disappointed in. Could the good BBQ place that is right in my own backyard have lost their mojo with the new surroundings that looked so hip? Turns out, that the new relationship didn’t work out and this chef left in the beginning of October, Abdul and his sons, Melvin and Davin went back into the kitchen and started serving their old style of Que and we’re all much happier for it. They smoke their meats low and slow for hours with Oak wood. Their St. Louis style pork ribs have always been my favorite dish there and they don’t disappoint. I also love their chicken. All of them have a great smoky flavor imparted by the Oak and I couldn’t be more thrilled to be able to walk a few blocks to get my Q on. 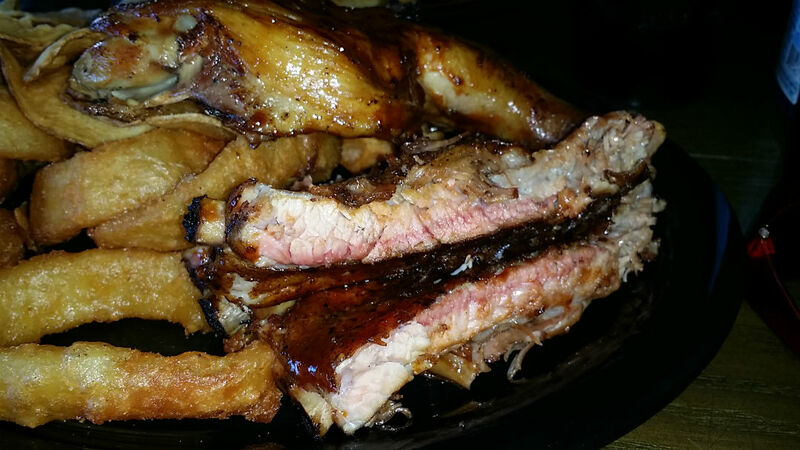 The ribs and chicken are always tender, fall off the bone good and just melt in your mouth. I prefer them without all the sauce on it, even though I do enjoy their sauces. They serve mild, medium and spicy versions. They ask you when you order which one do you want, so if you’re not a sauce person, just say no sauce or it will be poured fairly heavy on there. Or ask for it on the side. Their ribs and chicken are well seasoned. Some places may be hiding something when they smother it in sauce (like that “other” place near by that doesn’t smoke their meats at all) but here I think it’s just because that’s the way they do it. Their sauce which does get cooked onto the ribs a bit, is a deep and smoky version. I like it for dipping my meats into. They also serve beef ribs and while I didn’t find them to be the most tender, they were quite tasty. Others have told me they were very tender, so sometimes that is a hit or miss thing. 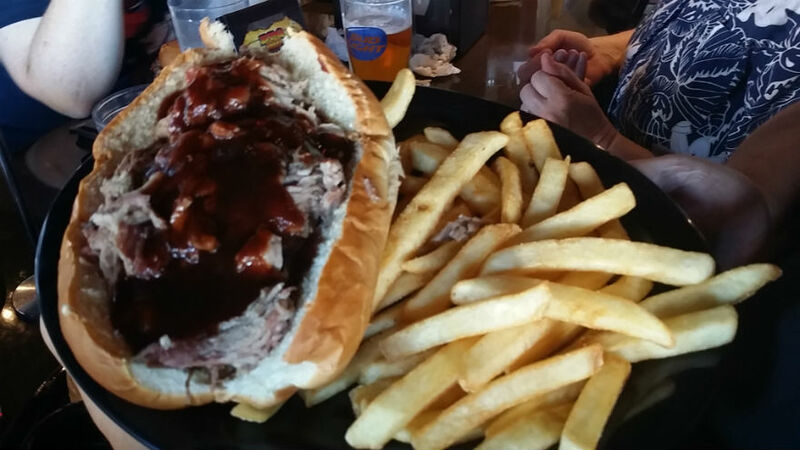 Recently, we tried their rib tip sandwich and that was a tender and delicious plate of meat. There was a lot of it and we really enjoyed it. 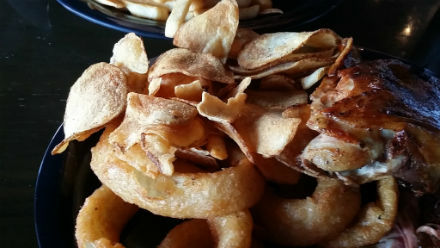 You can also enjoy their rip tips in a platter with two sides. Rib tip sandwich. A new favorite! 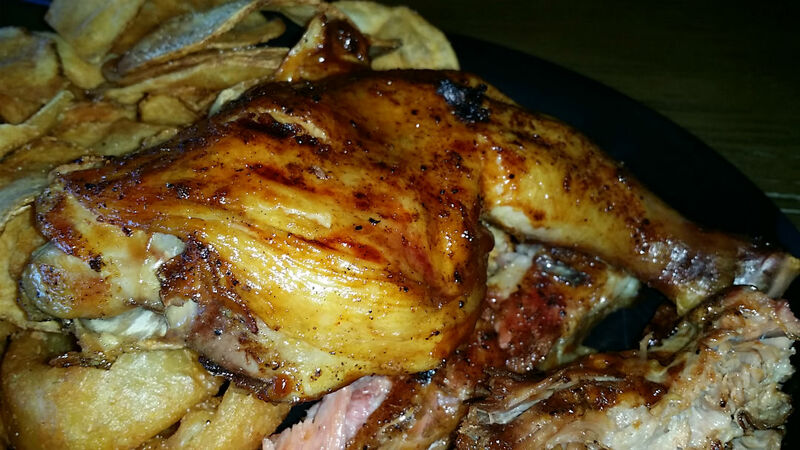 BBQH also serves beef brisket, pulled pork, chicken breast and ham sandwiches. One that I like is their California sandwich served with any meat you like and a couple of big onion rings inside the sandwich. Burgers, (several vegetarian versions also) and Turkey burger and hot links, which I keep forgetting to try! They also have an all beef hot dog and a veggie dog too. The one thing that took me so long to order and if I can ever pull myself away from their ribs, I have to remember to order again is their BBQ Burrito. 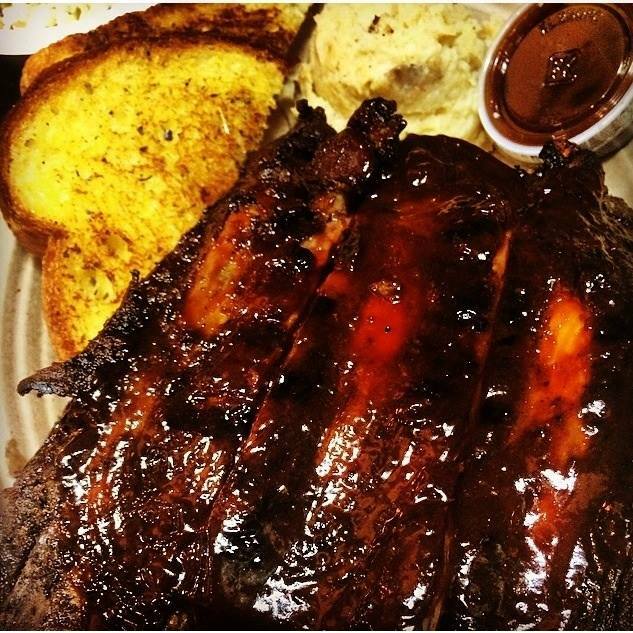 You can choose any two meats and those are complimented by cole slaw and beans with some BBQ sauce on it. SO damn tasty! They even do a Black Angus burger with your choice of roast BBQ meat on there called a Dough Boy….and oh boy is it ever filling! Onto the sides. I have always been a fan of their onion rings. They did stray away from the ones they make when the new chef was there and I was really bummed out over what I felt was an inferior product. Now they’re back to their old recipe and I couldn’t be happier. Flavorful and not overly breaded with a tempura style coating. Never been a fan of the panko type. These are a must order every time I go. One of the new sides they have is house made potato chips. These are also quite good and have become a new favorite of mine. The bf likes their mac ‘n cheese but I’m not a fan. I’m not a fan of most mac ‘n cheeses, so I may not be one to listen to on this. The fries satisfy and I have my special thing I like to do with them. 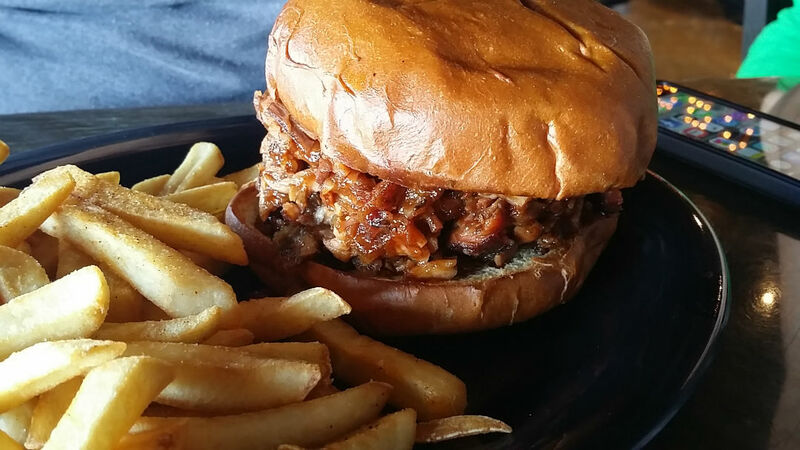 I order their inexpensive Sloppy Joe sandwich, minus the bun and have them pour the meat onto the fries. Some BBQ sauce on top of that and I have my smoking Que version of carne asada fries, so delish! They now have a dish called House Famous Fries. Their seasoned fries smothered in your choice of any of their BBQ meats, topped with melted cheese and BBQ sauce. Mmmmm…good. Other sides include potato salad, coleslaw, beans, mashed potato with gravy, rice, sweet potato fries, cream cheese jalapeno poppers (good! ), garlic bread, corn bread and pita bread. 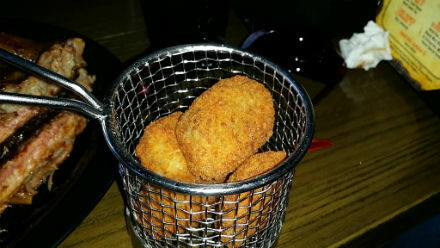 Jalapeno cream cheese poppers. Yummy! You can order their meats by the half and full pound portions too. If after eating all that you have room left for desserts, they can satisfy that craving too. Mud pies, deep fried Oreo cookies, two types of cheesecake and bread pudding. Oy! Maybe take some home for later? In addition to all the yummy Que there is a full bar with over 30 rotating beers. The new bar is good looking for sure. A great addition to the total face lift. Kids menu too! Counter service only. They also do catering. Fri & Sat 11 am to 10 pm.